It's about an antihero, after all. (SPOT.ph) The trouble with some films that defy convention is that it confounds critics because of its structure and delivery that it ends up garnering low marks by virtue of its refusal to be boxed into any specific genre. Venom suffers from exactly that problem of having a split-personality, and not just the character but the film itself. 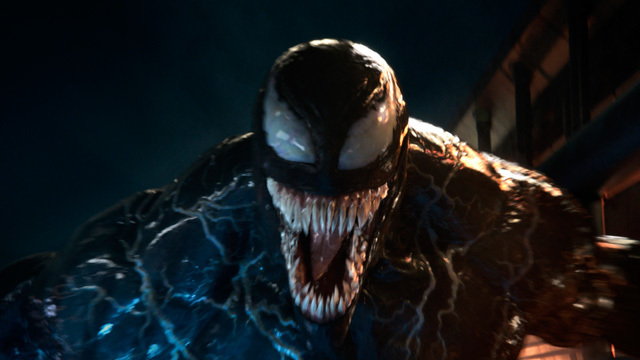 Director Ruben Fleischer, who managed to adeptly blend horror and comedy with Zombieland, tries to combine similar ingredients in Venom but only just manages to pull it off. The titular character sprang to life, quite literally, in the pages of Spider-Man. Originally designed in the '80s as a slick, new, black costume for the friendly neighborhood web-slinger, Venom was later revealed to be an alien symbiote who swears vengeance against its former host after being discarded. Hell hath no fury like an alien scorned. In the comics, the symbiote finds its way to disgruntled reporter Eddie Brock (Tom Hardy), who also has an axe to grind against Spider-Man, and together they fuse to become Venom. The character eventually became so popular that Marvel decided to turn him into an antihero instead of just another entry in Spidey’s rogues gallery. So here we are, some 30 years later, with a full-length feature film about a character who started out as a costume. With the Spider-Man property complicatedly shared by Sony and Disney (therefore legally unusable in any non-Disney Marvel film), Venom gives us a completely reworked origin that hews as close to the comics without mentioning the webhead at all. Michelle Williams plays Brock’s fiancée Anne Weying, a corporate lawyer representing the Life Foundation, a tech and pharmaceutical corporation founded by the deeply unethical Carlton Drake (Riz Ahmed). Inspired by real-life megalomaniac Elon Musk, Drake also sends up rockets into space in search for habitable planets. 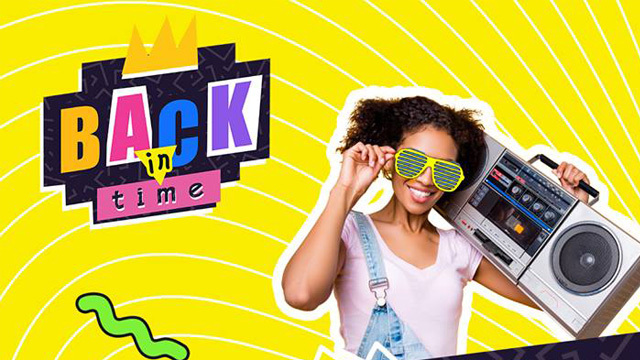 The film opens with one of Drake’s space shuttles crashing in Malaysia and letting loose a symbiote that the foundation had been secretly farming off a neighboring asteroid. Brock is an intrepid reporter who loses his job and his fiancée in one fell swoop because he can’t resist taking potshots at Drake, whom he believes is up to no good, and because he has no respect for privacy. The great thing about this film is that it stars a pair of supremely talented actors in Tom Hardy and Michelle Williams. The bad thing is that Hardy and Williams have absolutely no chemistry whatsoever. This is tragic because much of the film’s heart comes from Eddie’s struggle to piece his life back together while trying to stay relevant in Anne’s. Without the audience rooting for the couple, this struggle falls flat. 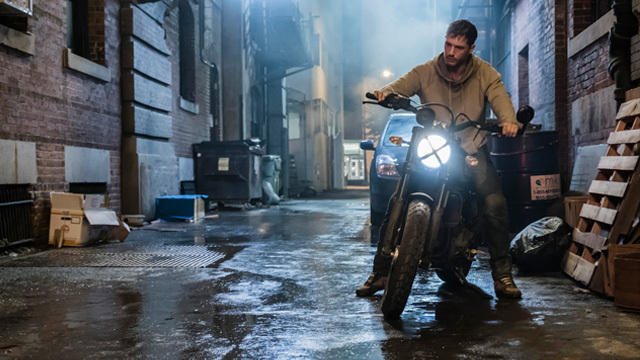 The one relationship that really shines, however, is the bromance between Eddie and Venom, brought to comical life by Hardy’s impeccable comedic timing and physicality as well as his vocal stylings. Hardy turns in a Buster Keatonesque performance as he adapts to the symbiote and plays his transplanted New Yorker accent against his gruff alien persona. This is the one part that Fleischer gets right and is almost worth the price of admission. The best part of the film is the banter between do-gooder reporter and hungry-for-human-flesh alien symbiote. While having an alien organism take over your body can be potentially terrifying, it’s played for laughs here and it actually works. This tonal disconnect between horror and comedy sometimes works and sometimes doesn’t, as the film can’t fully commit to one or the other. 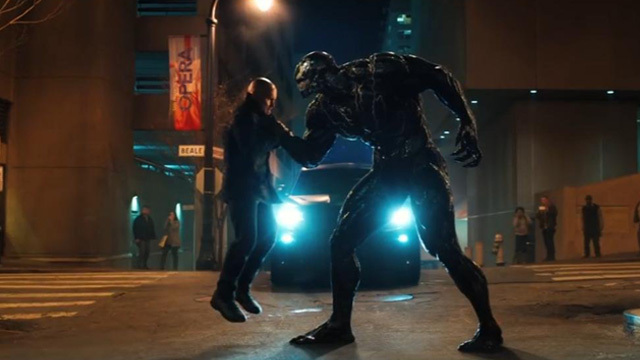 Venom kicks off with a body snatchers-like opener as the rogue symbiote jumps from body to body trying to make its way to the Life Foundation headquarters in San Francisco (on a side note, the clever choice of setting the film on the West Coast helps greatly to excise Brooklyn-based Spider-Man from the narrative). Unfortunately, the film abandons that approach halfway through and reverts to being a typical superhero origin story from the point where Venom fuses with Brock. Fleischer may have consciously steered away from the Zombieland formula, but it certainly seems like it could’ve worked. Some of Venom’s more chilling bits are when the alien finds potential new hosts and discards their old ones. While the story is simple and straightforward, it’s a mixed bag of horror, comedy, action, love story, and a dash of superheroics. 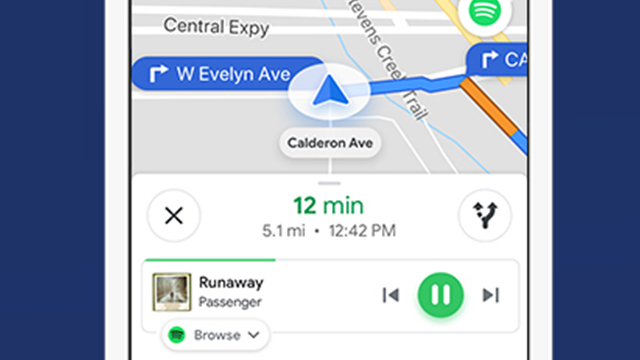 The action is unspectacular, although there are moments of absolute fun in the car chase through the streets of San Francisco that ends on Beale. When it lapses into a typical superhero—or antihero, in this case—approach, Venom flounders. When it ventures into horror or comedy, it really works. 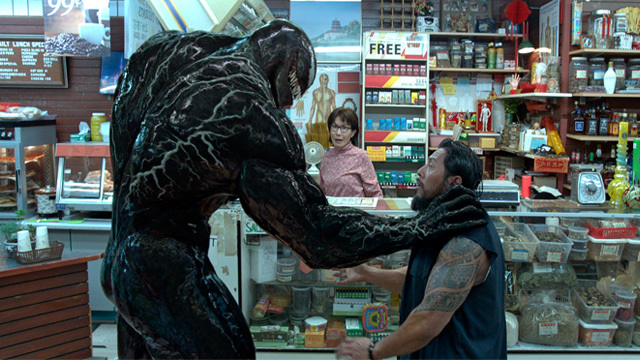 The film spends nearly a third of its running time building up Brock’s character as a lovable loser and the payoff is great, specially when Venom confesses to him that he, too, is a loser in his home world. The film would’ve benefited greatly from exploring that bromance even further, going a long way towards explaining why the alien Venom suddenly becomes a fan of planet earth and its people. 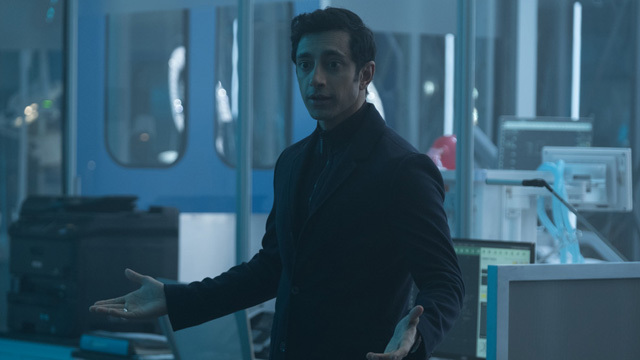 One of the film’s weak links is Riz Ahmed, who is a decent actor but doesn’t emanate a sinister vibe. He lacks the imposing presence of a Mark Strong or the hidden menace of a Christoph Waltz. In a movie where the titular character is himself a villain, there needs to be a truly terrifying bad guy for there to be any sense of risk. Even when Venom declares that his opponent “has an arsenal,” or “has got sh** that you ain’t seen,” you aren’t convinced at all that Brock is truly in any danger. Comic fans will enjoy little touches like the cameo appearances of She-Venom and another, hugely popular symbiote (be sure to stay for two after-credits stingers). The inimitable Stan Lee also shows up, sadly looking at his frailest out of all the Marvel films. It isn’t the most memorable or stellar superhero film, but it’s solid super-, or rather anti-, hero entertainment that delivers. Venom is out on theaters today, October 4.